Rubber products often perform better when a coating is applied – to reduce frictional resistance, for example, or to increase resistance to chemicals. With RX® SurfaPlus, ERIKS gives you a wide range of options. Rubber (or elastomeric material) is becoming increasingly important in the fascinating world of sealing. Which is no surprise, given the fact that rubber is flexible and resilient, strong, and easy to produce and assemble. Moreover, rubber is very resistant to many different media and temperatures, and the price is also very attractive. The only drawback is the frictional resistance of rubber, which can cause wear and (excessive) frictional heat at the seal. Another problem is that O-rings can get stuck in the packaging during automatic assembly. ERIKS 'SurfaPlus' surface treatment for rubber products is the perfect solution for these drawbacks, not just in O-rings but also in hydraulic and oil seals. For example, the right coating will lower the frictional resistance in dynamic applications, increase chemical resistance and/or make it possible to automatically assemble of O-rings problem-free. Other common treatments include surface cleaning of the seal (‘labs-free’, to prevent contamination), protection of the seal against low-pressure jets and/or hot water with detergent, and the reduction of ageing by protecting seals against ozone and ultraviolet radiation. Moreover, numerous RX® SurfaPlus coatings can be manufactured in every possible RAL colour, making them easy to recognise and also visually attractive. It is very important to first test the chosen surface treatment for your specific application. Contact our SurfaPlus specialists for optional advice: tel. 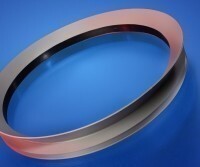 : 31 (0)72 514 18 55 or email: sealing@eriks.nl.